The Dashboard is the first page you encounter when you sign in to Skytap. You can think of it as a homepage that presents a summary of your Skytap usage and your owned resources. The Dashboard contains a number of different sections that display this information and let you interact directly with your most-used resources. The Getting Started section features training lessons, how-to videos, and documentation to assist new users in working with Skytap. By default, this section displays how-to videos for the most common use cases, such as building an environment and accessing a VM desktop. Click Training Academy to view training courses that can help you master Skytap. Click Videos to view short videos that explain individual features of Skytap. Scroll right to see more videos. Click Documents to view a selection of the help documentation that is most useful to new users and administrators. Scroll right to see more documentation. Click at the top of the section. Click the display switch next to Getting Started content. The Recent Items section lists recently used environments, templates, and projects. Click Environments, Templates, or Projects to display the 20 most recent items of the type you’ve selected. The most recent items are at the top of the list. My Recent Items – shows items that you have recently used. Shared Recent Items – shows items that have been recently used by you, or anyone that you have shared them with (via projects or sharing portals). All Users’ Recent Items – is a filter (administrators only) that shows the most recently used items for the entire customer account. You can also run, suspend, and take actions on recent environments from this module. The environment is created, has a VM added to it, or is added to a project. A VM in the environment is run, suspended, shut down or powered off. The template is created, either by saving an environment or importing a VM. A template is deployed as an environment. A template is merged with an environment (the VMs from a template are added to an environment). A template is added to a project. A environment, template, asset, or user is added to the project. A environment, template, asset or user is removed from the project. If you are not an administrator, the My Usage section displays your current usage and the storage, SVM hours, and concurrent SVMs that remain available for you to use. The amount of the resource you are currently using. The limit associated with your user account. This limit is set by the account administrator. The unused amount of the resource available to you. This is the amount remaining in your user, department, or company (account-wide) limit. A bar graph illustrating the amount of the resource you have used against the smallest limit that applies to you (your user, department, or company limit). 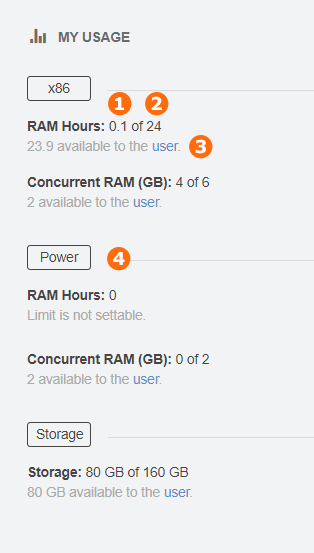 Usage statistics for Power VMs (if enabled for your account). If you are an administrator, you can toggle between viewing your Personal account usage and the usage for the entire Company account. Administrators also see any usage in excess of account subscription amounts. The usage categories are segmented to display current usage, relative to the account subscription limit and bursting (usage above the account subscription limit, up to the burst limit). The unused amount of the resource available to the account. The amount of the resource currently in use for the account. The account subscription limit for the resource. The amount of resource over the subscription limit available for use (the burst limit) for the account. The amount of resource over the subscription limit in use for the account. For more information about the account limit, subscription, and max settable limit, see Usage overview. 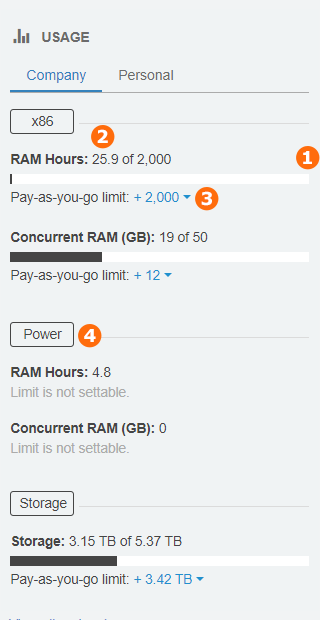 Storage limits are shown as base-two values in this module (a 5000 GB limit appears as 4.88 TB). A red usage bar means a user, department, or account limit is reached.